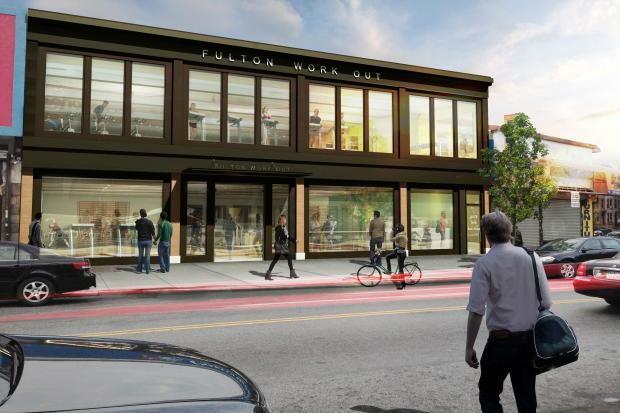 BEDFORD-STUYVESANT — A retail clothing store on Fulton Street in Bed-Stuy has closed to make room for a 22,000-square-foot gym. Pretty Girl, at 1245 Fulton St., shuttered on Thursday so construction can begin on a new three-floor Planet Fitness, according to employees of the shop. The gym's due to open in 2015. Planet Fitness leased the space from landlord Infinity Real Estate LLC in October, and will build a second floor on the one-story building while converting the basement into additional gym space, according to a release from the company. The new gym will be the first in the neighborhood other than the Bedford-Stuyvesant YMCA. “Due to the tenant’s aggressive expansion program and strong area presence, ownership considered Planet Fitness to be an attractive retail tenant,” Zach Mishaan, the landlord's broker, said in October. Representatives from Pretty Girl did not respond to a request for comment. A new shop called Installation Brooklyn sells "upcycled" vintage furniture, gifts and clothes at 433 Nostrand Ave. The shop, which is open Wednesday through Sunday, started out as part of a weekly flea market at Nostrand Avenue and Hancock Street, and expanded into the storefront in late December, said shop owner Margot Hughes. Hughes, who comes from a television set directing background, curates vintage items and gives them a modern touch. "I like to take old pieces and bring them back to life," Hughes said. "Most people don't know how to do that or don't know exactly what they want to do. We take some of the guesswork out of it." In addition to the normal store hours — noon to 6 p.m. on weekdays and noon to 8 p.m. on weekends — the shop will continue its outdoor market on Saturdays outside the shop year-round. Civil Service Cafe, at 279 Nostrand Ave., will serve up coffee, pastry and a side of art. Cafe co-owners Ayo Balogun and Milad Zarrin took over the former location of the Tiny Cup cafe in late December — repurposing much of the old cafe's interior for a new look — and will begin art openings and closings later this month as part of a series called "Department of Culture," curated by Parsons Professor Tiffany Webber. The shop also offers up single-origin, free trade coffee and pastries from Ceci Cela Patisserie. It will open a kitchen later this month for housemade food. Corner Grind, a new cafe at 1183 Bedford Ave., opened in late December and offers up coffee from Brooklyn Roasting Company and doughnuts from local doughnut shop Dough. Another retail shop, Milad Bed and Bath at 1297 Fulton St., closed in late December. The store, which sold everyday items, did not have its lease renewed by its landlord, according to shop workers.